Focusing on the worst Star Wars characters that side of Jar Jar, Star Wars: Ewok Adventure places the player in the shoes of the warlike teddy-bears who aid the Rebels in their fight against the Empire in the closing third of Return of the Jedi. Or rather, it would have been had it not been cancelled. The controls were allegedly too complex, though it’s hard to see what was so prohibitive about the experience when watching the gameplay. The game’s sort of a vertically scrolling shoot-em-up, with a few cool mechanics. You can ascend or descend in the glider, pick up rocks to drop on enemies, and even comandeer an AT-ST! Alas, the game was not meant to be and only one physical copy was produced. Which was then given to someone and then sold for $1600. 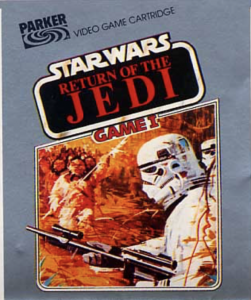 It’s difficult to understand how they couldn’t make this game work as a retail release, given the ‘THIS WILL PRINT MONEY FOR YOU” nature of all Star Wars merchandise in the 1980s. Perhaps Parker Brothers didn’t want another E.T. on their hands and had understandably cold feet. Anyway, the game exists and is playable on archive.org. It’s worth a look; if nothing else, the color palate is on point.